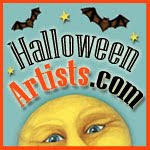 It's day 21 of Smeared and Smudged Forum's 31 Days of Halloween Blog Hop! Can you believe it? It's going by so fast! I love all the wonderful projects that I'm seeing on my daily hops! 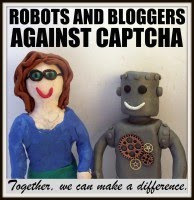 Take a bow, Wicked Bloggers! By now, you know that I save - nay- seek out fun tissue boxes. The whole sides are usable for just about anything, but the overlapping sides are only partially useable. Well I liked this little guy enough to carefully take him apart and put him back together. Apropo, no? Glitter glue - I used black to make the "stitches"
1. Cut out your focal panel and decorate with glitter glue if desired and allow to dry. 2. Punch 2 holes toward the outer edges on the top and punch 5 holes on the bottom edge. 3. Add grommets to the holes. 4. Cut a 16" piece of wire and fill half way with beads. 5. Slide all the beads to the middle of the wire and put the wire tails through the top 2 holes from back to front. 6. Use the round nose pliers to start a spiral on the wire tails and roll them up to the holes. 7. Make or buy 5 charms. If you make them, slide 2 or 3 beads on a headpin and make a large loop. 8. Slide the charms though the grommets on the bottom and wrap the wire tails around to secure. 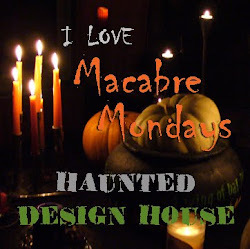 Candace your creations are so much fun...i'm going to miss you when the 31 days of halloween are over...your site is the first site i go to each morning...love the door hanger and thanks for sharing the instructions! Oh my heck, Wendy! I'm so honored! Thank you, thank you! AWESOME Door Hanger!!! LOVE the beads!!! Wonderful door hanger and thank you so much for the tutorials, they are very inspirational. Thank you for sharing. And, I didn't even know that tissue boxes came with such cute graphics. Guess I need to get out more! This is such a creative project but then, I always think that when I see your projects!! What a super fun door hanger! Loved the video tut too, great job! Candace, is there anything you cannot do? You have some of the most inventive projects I have ever seen and I love the way you make use of everyday items that most would throw in the trash. Thank you for sharing yet another fantastic, inspirational project! Lady B, you make me feel so loved! Thank you! Amazing project! Love your creativity, you always inspire me. I love the colors and the way they just make me feel happy. the project is fun your work is fabulous.